The Marshall Island natives were master navigators who tracked their way across huge expanses of ocean without any of the complex aids, such as the Greek astrolabe or the sextant, compass and chronometer, which Europeans found essential. As late as 1837 a British ship set sail for Rarotonga, in the Pacific, from an island less than 150 miles away, but even with the help of a chart, a compass and telescope failed to find it. Yet centuries before, the Marshallese had pinpointed a minuscule landmark like Easter Island. Before their first contact with European civilization in the 16th century the Marshallese and the other Polynesians had perfected both ocean-going canoes that were as maneuverable and swift as any small craft ever devised, even by an industrialized society, and a unique system of piloting that represented on a kind of chart.The hulls of their canoes, constructed of hand-hewn planks that were tightly fitted and stitched together with coconut fiber cord, were knife-thin and kept stable in the water by a cantilevered outrigger float on one side. Driven by a lateen sail, the canoe could be easily tacked and sailed up very close to he wind, without making undue leeway, as well as sailed down wind with minimum drag in the water. 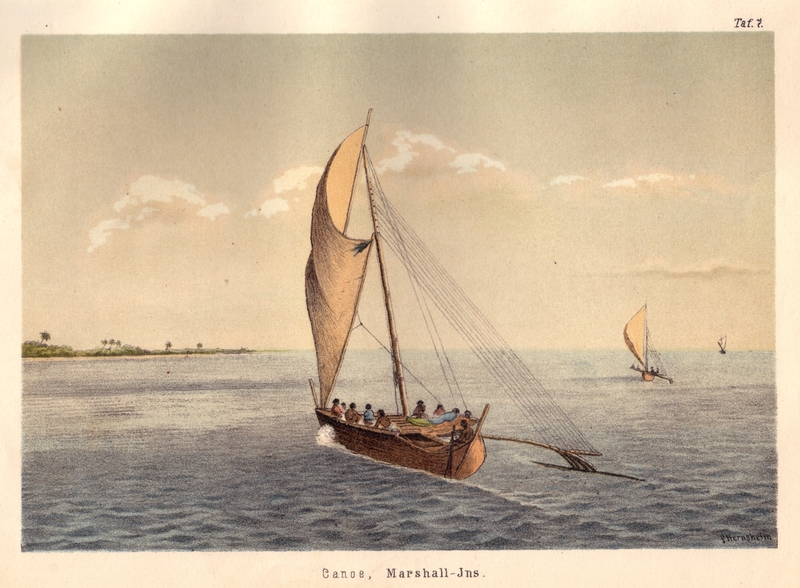 With such seaworthy and manageable craft as these, regular communication among the 34 coral atolls of the Marshall Islands was possible, even though the tiny islands of this group are widely scattered and all are so low that none can be seen from more than a few miles at sea. Much of this empirical knowledge was not so well known by scientific oceanographers of our society as it was by Marshallese seafarers until aerial photographs were available for studying wave and swell action. When oceanographers began to study ocean swells it was found that their action conformed to the laws of wave theory in the same ways as do light and sound. For example, when an ocean swell strikes a shore, part of it ts energy, that is reflected at an angle equal to the angle of its incidence. And when a swell approaches, strikes, and part of it moves part a small island, such as one of the Marshall Islands atolls, its line of movement is changed according to the angle of shoreline toward which it is advancing. The crest line of a swell approaching the shore of an island is bent and curved toward conformity with the shoreline. This occurs because the inshore position of the wave is slowed down as it encounters shallow water, its energy is expended by breaking or peaking up the wave, thus slowing down the forward motion while the offshore portion in deep water continues advancing at a constant rate of speed. This is swell refraction. Finally, a turbulent shadow of a special kind, resembling a penumbra, is to be found extending out from the lee side of an island for several miles. The art of reading the waves was taught to Polynesian boys with the aid of the mattang, a stick chart, a web of interlocking sticks which demonstrated all the basic patterns that waves can form when they are deflected by land. The adult navigator gauged these wave patterns entirely by his sense of touch. He would crouch in the bow of his canoe and literally feel every motion of the vessel. In this way the original colonizers of Easter Island might have ‘felt their way’ across thousands of miles of open sea to their remote new home. The horizontal and vertical sticks are intended as supports to the chart, while diagonal and curved ones represent wave swells. The information was memorized and the charts would not be carried on voyages. Like all navigators they used the stars as fixed points of reference. They understood the significance of stationary clouds, the presence of birds and flotsam as indications of nearby land. But most extraordinary of all, they had learned how to read and interpret the changing patterns created by ocean waves. Stick charts were typically made from the midribs of coconut fronds tied together to form an open framework. Island locations were represented by shells tied to the framework, or by the lashed junction of two or more sticks. The threads represented prevailing ocean surface wave-crests and directions they took as they approached islands and met other similar wave-crests formed by the ebb and flow of breakers. Individual charts varied so much in form and interpretation that the individual navigator who made the chart was the only person who could fully interpret and use it. Use of stick charts and navigation by swells apparently ended after World War II, when new electronic technologies made navigation more accessible, and travel between islands by canoe lessened. Unlike traditional maps, the mattang were studied and memorized prior to a voyage and were not consulted during a trip, as compared to traditional navigation techniques where consultation of a map is frequent and points and courses are plotted out both before and during navigation. Polynesian navigators used their senses and memory to guide them on voyages by crouching down or lying prone in the canoe to feel how the canoe was being pitched and rolled by underlying swells. The Marshallese recognized four main ocean swells. Navigators focused on effects of islands in blocking swells and generating counterswells to some degree, but they mainly concentrated on refraction of swells as they came in contact with undersea slopes of islands and the bending of swells around islands as they interacted with swells coming from opposite directions. The four types of ocean swells were represented in many stick charts by curved sticks and threads. The rilib swell is the strongest of the four ocean swells and was referred to as the “backbone” swell. It is generated by the northeast trade winds and is present during the entire year, even when they do not penetrate as far south as the Marshall Islands. Marshallese considered the rilib swells to come from the east, even though the angle of the winds as well as the impact of the ocean currents varied the swell direction. Stick charts were not made and used by all Marshall Islanders. Nor would every one in the community have access to the knowledge of making them. They were closely guarded secrets of the family of the chief, and knowledge was passed down father to son. So that others could utilize the expertise of the navigator, fifteen or more canoes sailed together in a squadron, accompanied by a leader pilot skilled in use of the charts. 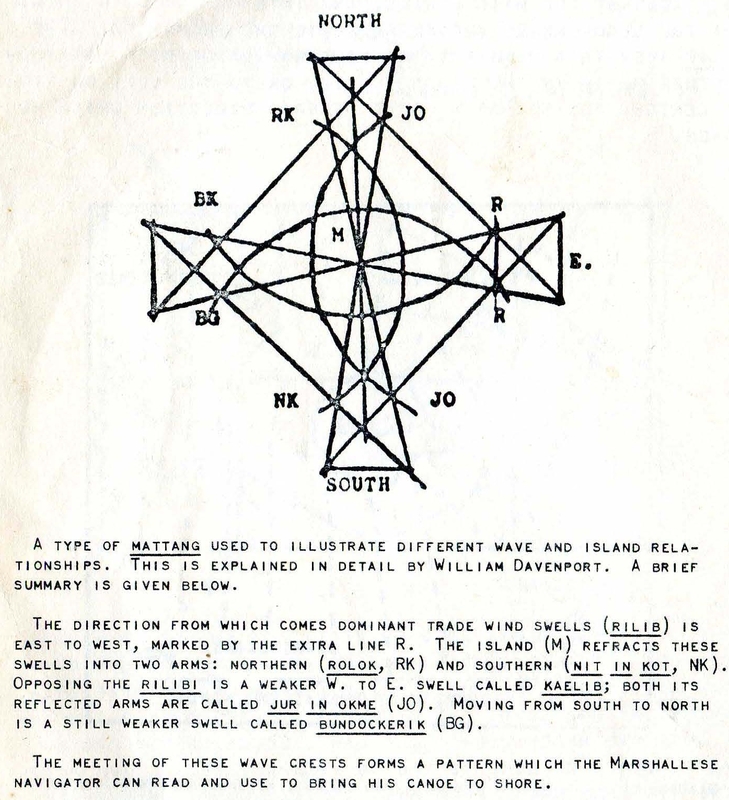 This entry was posted in Maritime history and tagged chart, map, Marshall Islands, mattang, Polynesia, wave pattern by svmblogger. Bookmark the permalink.